On Tuesday, I had the opportunity to visit my first “bot shop”. If I am being completely honest, I had no clue that a bot shop is a place where robots are made, trained, and fixed. I assumed it was either a store or a car shop. Once we arrived at the shop I immediately felt like I was behind the scenes of the movie Transformers. There were huge robots zooming around uncontrollably flashing their red and blue lights, sweeping up wiffleballs and then launching the wiffleballs into the air towards platforms. For a spaz like me it was an interesting yet humorous experience. 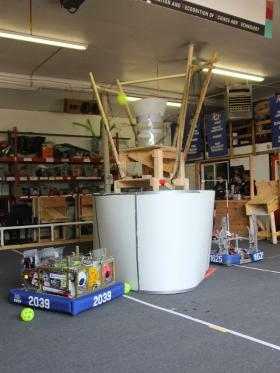 The Winnovation Bot Shop was full of robotic material, robots, teammates and opponents. In my opinion, it seemed the bot shop was THE perfect hangout place. Not to mention, the music they played was my kind of music. I won’t lie, I caught myself bobbing my head a couple of times while I intently watched the robots. There was a huge ring surrounded by bumpers where the robots would practice. Comfy car seats were spread out in which you could sit and watch the robots speed around. All the people in the shop were fun to be around, dedicated, focused and oddly enough very laid back. I was introduced to their robot named “Zuko”. Zuko was a mean, not lean, fighting machine. He did in fact have googly eyes which made him more human-like. He was clocking in at around 110 pounds, was full of wires and had a rapid take off. They had explained how strenuous and time-consuming building a robot was. One of the teammates told me they had a building period of only 6 weeks. That meant that in just 6 weeks they had to finish their robot to compete in the upcoming competition. A total of 200 hours was put in by more than one individual. By the time we had finished our conversation about all the variables it took to make their robot, I felt like I had built my own – in my dreams. I was in disbelief just having looked at all the wires, cords, wheels, pulleys and lights on the robot. 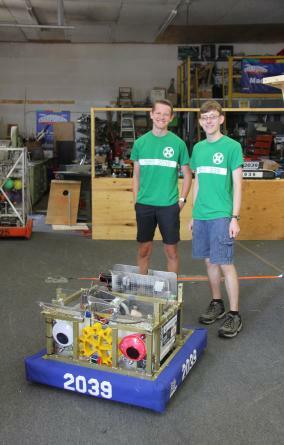 The upcoming competition taking place July 29 that teams are preparing their robot for is the Rock River Off-Season Competition. 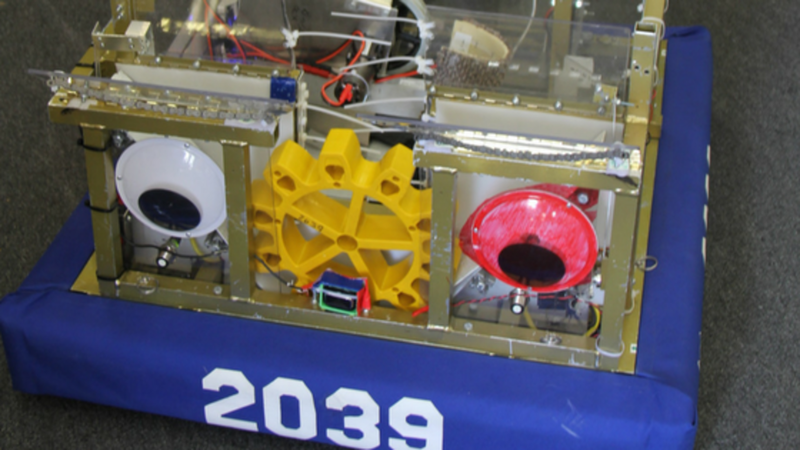 Since the robotics off-season is during the summer R2OC helped with the creation of a public competition to promote robotics. R2OC (Rock River Off-Season Competition) is a non-profit organization that was created by several students in the fall of 2012. 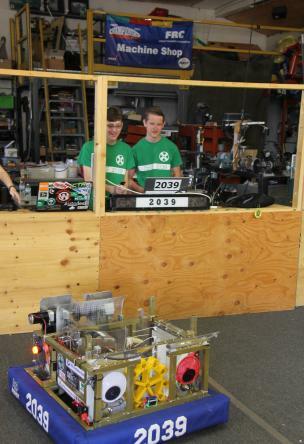 Students from all different teams such as Flaming Monkeys, Metalheads, Rockford Robotics, Stateline Robotics and Winnovation worked together and sought out help in the community in hopes of creating a tournament. The amount time and effort that the robotics team puts in to create their one of a kind robot is amazing. I couldn’t even imagine all the patience and intelligence you would need to have to work with such obscure and intricate objects. The upcoming competition will take place on Saturday, July 29 in the Rock Valley College PE Center. In honor of the 5th year this year will be the first time that four $1,000 scholarships will be handed out to four R2OC student participants graduating in 2017 or 2018. R2OC is ready to kick off their 5th Annual Rock River Off-Season Competition with a total of 36 teams from the Midwest. The event will begin with an opening ceremony at 8:45 a.m. and continue throughout the day until 5 p.m. Admission is free and concessions will be available to purchase. I encourage you to check out this awesome event!